Ireland coach Joe Schmidt says Luke Fitzgerald can challenge Robbie Henshaw for the inside centre starting position as the World Cup progresses. Schmidt hailed Leinster's utility back Fitzgerald for slotting seamlessly into Ireland's number 12 shirt for the 50-7 rout of Canada in Cardiff on Saturday. Henshaw missed the World Cup opener with a hamstring injury but should be fit to face Romania on 27 September. However, Schmidt is tipping Fitzgerald to compete for a regular midfield role. 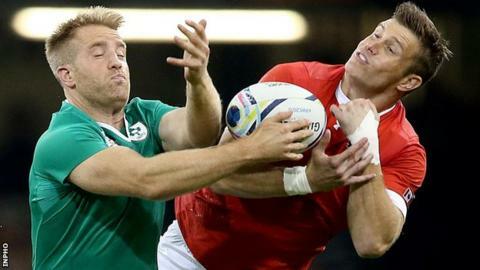 "Darren Cave plays 12 or 13 and that's a real advantage for us," said the Ireland boss. "But we always intended giving Luke a chance at 12, because he has played 13 and 11 in the build-up, and we wanted to build our versatility. "Darren's pretty likely to have an involvement next week, and that will allow us to mix and match a little bit as we have done through the build-up period. "But at the same time we know we have got to get results and we have got to go after them right from the start." The decision to select Fitzgerald out of position at 12 ahead of a natural inside centre raised eyebrows, but Schmidt insisted he needed to use all his resources during the pool stages. "I thought Luke did really well at 12, his distribution to give Dave Kearney space for his try was great," added the winning coach. "Defensively he was sound and his ball-carrying is a strength." On the game overall, Schmidt said: "I felt we built our way into the game pretty well. I think we showed a fair bit of respect for Canada. "Canada showed why they deserved that respect. They are a very combative side. "For us to build our way into the game and successfully put a few phases together effectively to build that scoreboard pressure on them as well was satisfying."